Villa Ajabo is in a brilliant location - the shops and restaurants in Callao Salvaje centre are only a short walk away. What's more the attractive natural black sand beach is less than 15 minutes' walk away. This 4 bedroom house is perfect if you don't want to drive on your holiday. Plus, it has homely interiors, a private swimming pool and pleasant outside dining area, all ideal for a relaxing holiday . 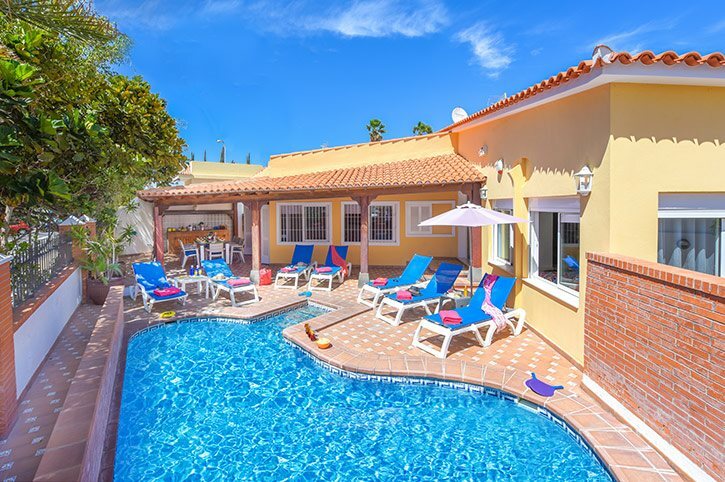 Air conditioning/heating in the bedrooms, WiFi and pool heating are included. Villa Ajabo is perfect for access to the shops, bars and beach plus, it's very homely inside! The outside area is great for soaking up the Canarian sunshine. There are sunbeds dotted along one side of the private swimming pool - great for relaxing with a good book . There is a covered terrace with a dining table and chairs plus brick built BBQ. It is also lined with plants and greenery making it ideal place to sit, relax and enjoy alfresco dining on those balmy nights. The main gate leads to the front door. Parking is available on the street. Villa Ajabo is a stylish single storey property which feels bright and comfortable. The main entrance hallway gives a feeling of space, and is a central point to the villa. The split-level lounge has views overlooking the pool area and comfortable seating. There is a large open plan well-equipped kitchen overlooking the dining area, which is light and spacious with access the covered terrace. The double bedroom has an en suite bathroom, and the hallway leads around to 3 further twin bedrooms next to each other . All bedrooms are bright and homely. There is a separate bathroom and WC. Villa Ajabo is in the much-loved resort of Callao Salvaje, located on a steep hill in a residential area. It is within walking distance to a pebbly cove, or a stroll to several restaurants, bars and shops. In the resort centre, approximately 10 minutes' walk away downhill, is the complex of Perla Blanca and Perla Gris. There's a great Italian restaurant on site, along with a cabaret bar holding plenty of family entertainment, plus a hairdresser too. Callao Salvaje is a small family friendly resort with a number of shops. The main bus stop is located within the village and has a regular bus service to both Playa de Las Americas and Los Gigantes for indulging in some retail therapy. The local market is held twice weekly in nearby Fanabe, on Thursdays and Saturdays. In the resort of Callao Salvaje there's a good selection of cafes, bars and restaurants approximately 10 minutes' walk away. The restaurants serve everything from ribs and pizza to Chinese, French, Italian and of course Spanish cuisine to suit every taste. There are a few bars in the resort, which also usually show major sporting events. The beach in Callao Salvaje has black sand made from crushed pebble, it's less than 15 minutes' walk downhill from the villa. It has sunbeds and a snack bar. Siam Park and Aqualand water parks, Jungle Park, and of course the famous Loro Park are great for a family day out. Alternatively, whale and dolphin excursions starting from Puerto Colon Marina should not be missed! Safaris to Mount Teide, downhill bike riding, horse and camel riding or the bowling alley are also popular. In Tenerife, there is a number of historical and interesting villages to visit. The famous pirates' village of Masca is on the West Coast. In Puero de la Cruz you can see the old colonial buildings and botanical gardens, La Laguna and Oratava. Or, the statues of the Gaunches and the Black Madonna are in Candelaria. The stunning Abama Golf Course is just before the village of Playa San Juan. Towards the south is the course of Costa Adeje Golf. Or, there is a golf course located in Playa de Las Americas too. For exploring the island, Callao Salvaje is well located almost half way between the bustling resorts of Playa de Las Americas and the picturesque resort of Los Gigantes, with plenty of places of interest in-between them. You can choose to travel through the national park, or take the faster route by motorway which is within easy reach, should you wish to visit the Capital Santa Cruz or colonial resort of Puerto de la Cruz during your stay. Villa Ajabo is not available to book for season as it is sold out. Take a look here at the Tenerife villas that are currently on sale. With a professional karting club located in the south of Tenerife, with 1 international track, and 1 children's track, this club can offer fun for the whole family. Located just 5 minutes from the South Airport, Karting Club Tenerife can be contacted on 0034 922 73 07 03 open daily from 10am to 8pm. This is the second time I've been on one of your holidays. Next one's booked for April! What a great villa, plenty of space, big bedrooms very well laid out, loved the huge fridge freezer, even the pool was warm. Not too far from the town and only a short walk. Would love to come back, if we are ever in Tenerife again. We had a fantastic stay in Villa Ajabo - couldn't fault the villa or our time there! Great holiday and I would use you again. Fantastic holiday - very relaxing, the taxi we booked with you was well worth it, very quick and when leaving, the taxi was at the villa on time - very impressed. This was our first time with Villa Plus and won't be our last. Very pleased, great holiday. We were delighted with the villa, it was well equipped and very clean. Will definitely use Villa Plus again and recommend to friends and family. Fantastic holiday was had by all. Excellent staff, nothing was too much trouble for them, highly recommend the team at Tenerife office. Have booked again, but this time in Menorca. The Villa Plus rep Lisa, visited on the second day to ensure things were ok, she was excellent, both down to earth and informative. A credit to your company. It made us feel like our stay and happiness while in the villas mattered. In all, excellent.